The Unbound Dremora is a special summon you get from Phinis Gestor during the Conjuration Ritual Spell quest. A hostile Unbound Dremora can also be summoned using the Atronach Forge in the Midden after the quest is complete. The Unbound Dremora wears a set of Dremora armor and carries a random leveled weapon with a fire damage enchantment. Unbound Dremora: "You dare bring me here? You must be punished." Player: "You will do as I say!" or "I summoned you. I control you now." 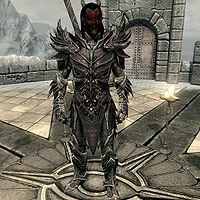 Unbound Dremora: "I serve no mortal!" "You control nothing, mortal!" Unbound Dremora: "I am not your plaything, worm!" Player: "Are you ready to submit?" or "Admit that I control you." Unbound Dremora: "Never!" "I'll tear out your heart first!" Unbound Dremora: "I am not yours to toy with!" Player: "Will you submit, or do I need to banish you again?" or "I can do this all day." Unbound Dremora: "I... I submit. What is your bidding, master." "No, I... I submit. No more. What is your bidding?" Player: "Bring me a Sigil Stone. Now." Unbound Dremora: "Yes, my lord/mistress. Summon me again, and I shall have your stone." Unbound Dremora: "Your sigil stone. Lord Dagon is... less than pleased at its loss." The spell can only be cast on top of the Hall of Attainment at the College of Winterhold. It can be "cast" in other locations, but will yield no results. Other summons will not be dispelled when you summon the Unbound Dremora. After the Conjuration Ritual Quest the Unbound Dremora becomes immune to any type of attack or damage. You will no longer be able to interact with him but he will continue wander about the College grounds, attacking any enemies in the area. If a dragon is killed nearby, the Unbound Dremora may go and observe like other members of the College of Winterhold, but will not say anything. It is possible to exit the conversation during the 1st and 2nd dialog and get behind it to pickpocket its weapon, if you have the Misdirection perk unlocked. The Unbound Dremora carries an Iron Dagger. The Unbound Dremora is never removed after the Conjuration Ritual Spell quest. It is possible to loot his weapon just before he disappears. This page was last modified on 8 February 2017, at 13:17.